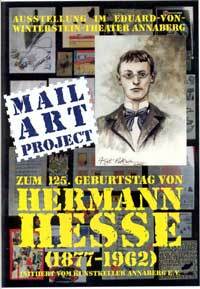 At the 125th birthday of Hermann Hesse the Kunstkeller Annaberg launches a Mail Art project under the direction of Jörg Seifert in 2002. Its title is All about Hermann Hesse. 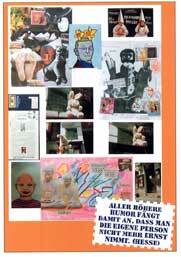 Böhm developes the story of the Tubinger author Hermann Hase. Together with some photos showing Hase in Tubingen, Germany this story is Böhm contribution to the project. Three of the photos can be seen in the middle of the first page of the catalogue.